In today’s increasing use of electronic navigation aids, the ability to correct and un-correct a compass heading or bearing seems to becoming a lost art outside of a classroom. 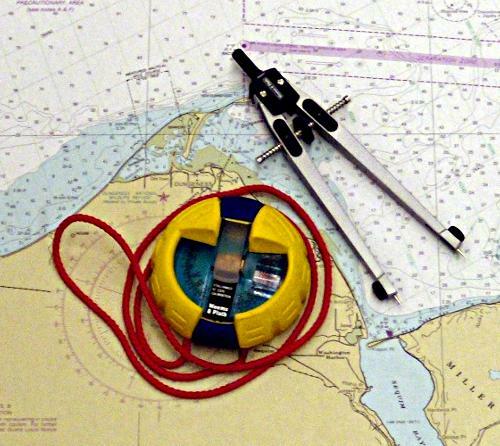 Here are a few TVMDC Practice Problems to help keep your navigation skills sharp. “Correcting” is converting a magnetic (M) direction to true (T). “Un-correcting” is converting from true to a magnetic direction. “True” direction is relative to true north (north pole). Deviation is the failure of the compass to point to magnetic north. Deviation is caused by local magnetic fields on the boat. These fields may be caused by the engine, instruments or other electronic equipment, power wiring, tools or any other magnetic objects. Deviation is specific to an individual boat. Deviation changes with the boats heading. Deviation is read from the Deviation Table on the boat. Variation is the failure of the compass to point to true north. Variation is read from the compass rose on the chart. Variation is the same for all boats in the same area. Variation is the same for all directions in the same area. I always use the same order for the formula working the solution either up or down, this always puts the same information in the same order, this makes checking the work easier and makes is easy for someone to double check the calculations. DON’T ever just do the good old piece of scratch paper where you just add one number to another, that seems to produce much higher rates of errors. 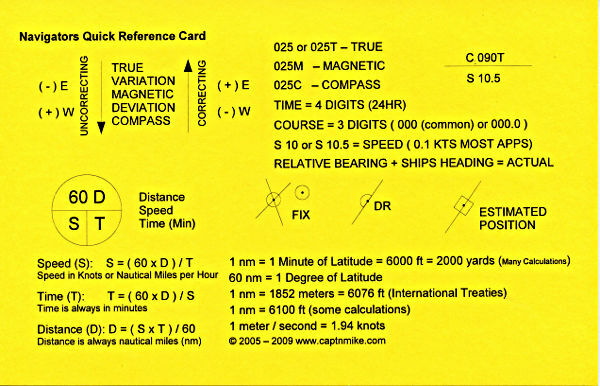 Navigators Piloting and Charting Reference Card – Reference card with help for correcting and uncorrecting a compass, speed / time formulas and other quick hints for navigators. More TVMDC – Practice Problems – Correcting and un-correcting the compass – 48 More TVMDC Practice Problems and TVMDC help. Correcting Compass Error – More TVMDC Practice Problems and TVMDC help. Printer Friendly TVMDC practice sheets (pdf). Thanks to Captain’s Nautical in Seattle for letting me use one of their compass’s and letting me spread a chart out in the middle of their store on the floor while I took the picture for the header. This entry was posted in Boating Safety, Navigation, Safety Thoughts, Sailing and Boating Skills and tagged Compass Practice, Correcting, Correcting and Uncorrecting a Compass, TVMDC, TVMDC Practice, Uncorrecting. Bookmark the permalink. The simpler method is to keep the gps in magnetic, Have the steering compass properly adjusted and do all plotting from the magnetic rose. True is only a problem when using a gyro. You will not be able to develop a deviation table for the hand bearing compass since it is portable. A properly adjusted steering compass should have residual deviation of less than two degrees on any heading, well within the steering accuracy of most helmsmen. sir can you gave me a easier method on how to solve variation and deviation error? I agree with captain mike – look at the answers he provided and do the math, you’ll pick up the pattern. I’m taking the oupv online course and it did a horrendous job of explaining everything. Thanks a lot captain mike, i’m printing off your cheat sheet as well. Very helpful indeed. God day sir !..,i want to clarify in the PROBLEM column 02, is the Magnetic becomes 357 or it is 003 either? and Compass was 004 or it is 010? Thanks a lot Captain Mike, your links is awesome. M-357 WHY THESE IS THE ANSWER? When you are moving from True to Magnetic (see the formula at the top of the page) you SUBTRACT EAST – since the True is 002T and we are going through 000 / 360. You might find this card useful Navigators Piloting and Charting Reference Card Print it out on heavy paper of contrasting color. WHY 357 IS THE ANSWER TO THE LETTER M? Take the time between high & low (or low & high) tide times. The time between is divided into 6 intervals – the first interval the water level changes 1/12 of total, – 2nd interval 2/12 of total, 3rd interval 3/12 of total, 4th interval 3/12 of total, 5th interval 2/12th of total, 6th interval 1/12 of total.